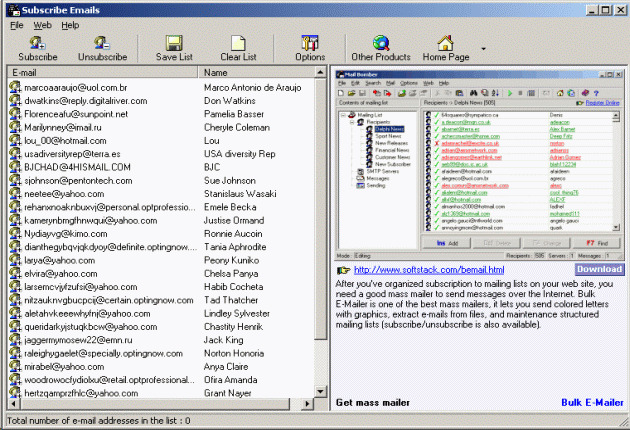 Subscribe Emails helps you organize subscription to email mailing lists on Internet websites. 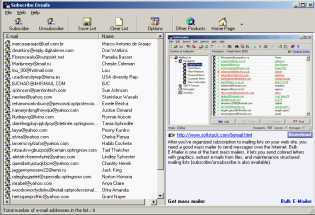 It lets you check POP3 email mailboxes for subscribe or unsubscribe email requests download email messages with the requests to your computer get email addresses and sender names from them and create text files with subscribers wanting to subscribe or unsubscribe. Having got text files with emails you can use them with any bulk mailer to add new subscribers and delete existing subscribers. The program is optimized for working with Bulk E-Mailer mass mailer and although Bulk E-Mailer has a built-in file and email subscribe and unsubscribe feature Subscribe Emails gives you more freedom and makes your job more effective. Subscribe Emails can be configured easily all you need to do to get started is to set up a couple of POP3 email accounts for subscribe and unsubscribe email requests and specify two phrases like SUBSCRIBE and UNSUBSCRIBE used for detecting requests of different types in the incoming mail.